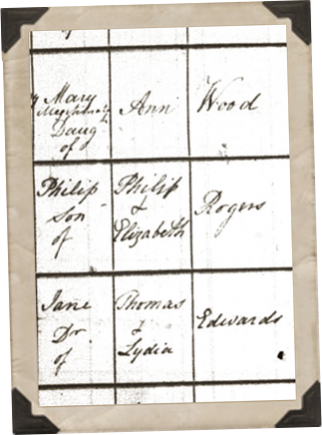 Philip Rogers was born in the weeks prior to 02 Mar 1827 when he was baptized in Caverswall, Staffordshire, England to his parents Philip Rogers and Elizabeth Smith. The family lived at the Cookshill Mill on Mill Close Road in Caverswall where his father was a Miller turning grain into ground meal or flour for local farmers.A The community would have been dependent on Philip as flour was an integral part of baking bread, a staple part of the diet, and meal was the primary food of livestock. The younger Philip grew up with 2 older sisters, Ann (1821) and Hannah (1824), as well as 2 younger brothers, James (1829), George (1831), and a younger sister Jane (1833). He also eventually had three half-siblings James, William and Thomas, but they did not come along until well after Philip married and left the house. 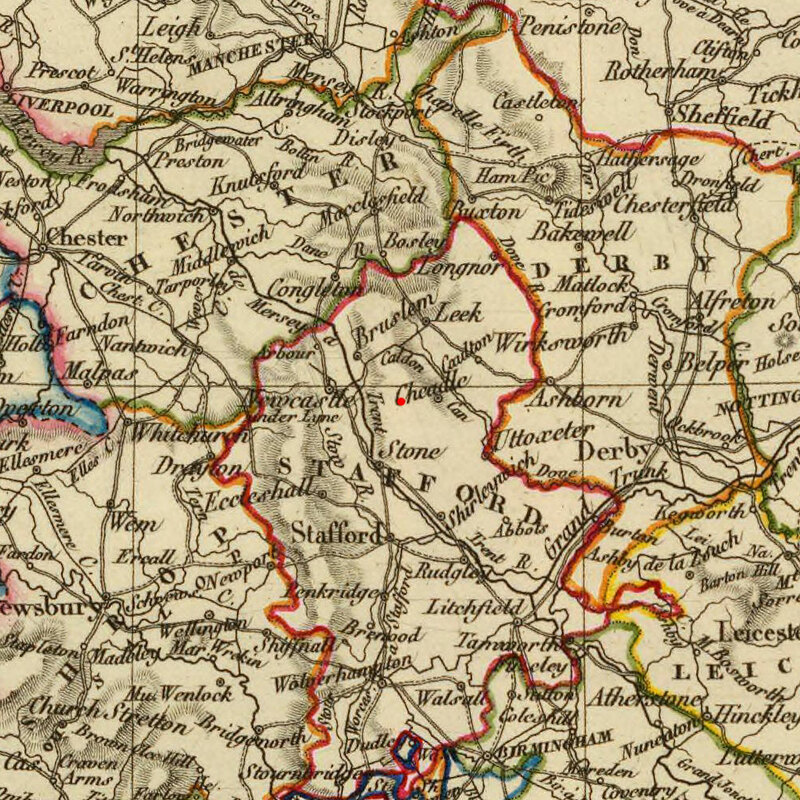 Sometime in Philip's early years (between the ages of 7 and 14), his family relocated from the town of Caverswall to Moddershall, which sits in the Liberty of Kibblestone, roughly 5 miles south of their previous home in Caverswall. It is here, where by 1841, his father was operating the Boar Inn and Mill (otherwise known as the Moddershall Mill). After their marriage, the couple moved into the New Inn Mill on New Inn Lane in Trentham, Staffordshire where Phillip found work in the trade he grew up learning from his father, a Corn Miller. Elizabeth was born the 14 Mar 1827 to parents John Salmon, a farmer, and Ann Birks at Knenhall Farm in Stone, Staffordshire (which is just north of Moddershall). She was baptized on the 14 Mar at Saint Michael's Church in Stone. Elizabeth grew up the 2nd eldest child with 5 brothers and one sister. Her older brother John came before her and she was followed by sister Martha, and brothers George, Henry, Charles and Samuel. By 1841 the family is officially listed at Hobbergate Farm on Old Road just north of Oulton Heath (2 miles north of Stone). In what undoubtedly would have been an extremely traumatic time, on 10 Oct 1865, son Thomas died for reasons unknown. Then, just over a month later, on the 23 Nov 1865, Philip passed away from diphtheria at the age of 38. This was followed two days later by not only Philip's burial, but by the death of son Joseph Frederick as well. Within a span of two and a half months, a family of ten was cut to seven, leaving widowed mother Elizabeth to pick up the pieces and carry on. It seems Elizabeth did just that, because on the 1871 census 6 years later, Elizabeth is operating the New Inn Mill herself and is listed as a farmer & miller of 28 acres employing 1 man (likely as a farm hand) and ten years later in 1881 farming 38 acres employing 2 men. Elizabeth was again noted as living at New Inn Lane in 1891 at the age of 64. Elizabeth Anne Rogers, Nov 1851 - ? A While Philip's birth date is not mentioned in the baptism notes, when the date of birth is recorded, it's generally within a few short weeks of the child's baptism. B While cloth and saw miller were other professions, its most likely that Philip was a corn miller as his son Philip Jr was a corn miller and would have most likely continued the tradition, apprenticing in his father's footsteps. C While the mill was retired in the 1950s and later demolished in 1965, the Boar Inn and pub still remains at the heart of the village of Moddershall. So much so, that the main photo of Moddershall on the village's Wikipedia page is a photo of the Boar Inn. The Inn sits on the lake the mill drew it's power from and is accented with a garden & duck pond out front. D While I haven't recovered the death records of Philip's children Thomas and Joseph, based on how highly contagious diphtheria can be, it's likely the death of all 3 family members in 1865 was related to diphtheria. Are there any records that could point to a more accurate time of arrival in Moddershall than between 1834-1841?